If you have a missing tooth, there are two possible options for replacing it, and both have worked very well for many patients. We’d like to explain the pros and cons of each approach. To place a dental implant, Dr. Thein first places a root form in the bone. This replaces the root of the missing teeth. This is allowed to heal, a process called osseointegration. 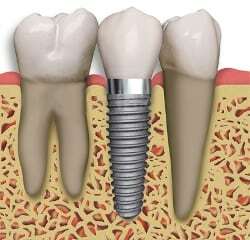 The bone grows around the implant and firmly fixes it in place. While it is healing, a temporary tooth is placed to hold the space and to give you some chewing function. If it is a front tooth that is being replaced, the temporary tooth needs to look just like a real one. After it is healed so that it can withstand stress, a permanent tooth is placed, giving a result that looks like the diagram on the right. The end result is that it feels and acts just like your own natural tooth. For a dental bridge, there is no surgery. Instead, the teeth on either side of the missing tooth are prepared for crowns. The outsides of the teeth are shaved down. Then an impression is taken and the case is sent to a dental laboratory to make the bridge. The bridge consists of two crowns, one on each adjacent tooth. Between the two is a false tooth that rests on the gum, as is shown by the diagram on the right. If it is a front tooth, it can be made so that it creates the illusion that the tooth is growing out of the gum. The teeth on either side do not have to be ground down for crowns. If these teeth are healthy, it seems like a shame to alter them so aggressively. Maintenance is easier in several ways. Cleaning is easier because you can brush and floss an implant tooth normally. Proper care of a dental bridge involves threading floss underneath it to clean those areas daily. Also, with a bridge, if there is any trouble at all with any of the three teeth involved, the whole bridge generally needs to be re-done. With an implant, if there is a cavity on an adjacent tooth, you can have a simple filling to fix it. There is no risk of irritating the adjacent teeth so that they might need root canals or other treatment. There is also no extra stress placed on the adjacent teeth, which helps preserve them. The repair is the closest thing to replicating what Mother Nature gave you. The result looks and feels very natural. Your tooth can be replaced right away. There is no waiting for healing. It is generally less expensive. If the adjacent teeth need crowns anyway, there is no advantage to avoiding aggressive treatment of those teeth. In some patients, their jawbone does not respond well to dental implants. We will present you with the pros and cons, and let you make the decision. We don’t believe in pressuring you into having dental work done that you don’t want. Our recommendation is generally that if the teeth on either side of the missing tooth are healthy, a dental implant is the way to go. 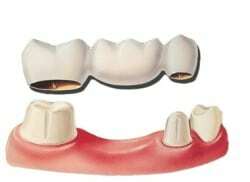 If they have large fillings, then a bridge is generally the best. If there are multiple missing teeth, that also tips the scales heavily in favor of implants.